If the light comes on while driving, stop the vehicle, stop the engine immediately, and check the engine oil level. If the oil level is normal and the light stays on after restart, have the vehicle towed to the nearest trained and qualified Volvo service technician. This is normal, provided it goes off when the engine speed is increased. This symbol illuminates when the parking brake is applied. On models equipped with the electric parking brake, this symbol flashes while the brake is being applied and then glows steadily. A flashing symbol means that a fault has been detected. See the message in the information display. Canadian models are equipped with this symbol. See page 122 for more information about using the parking brake. If this light comes on while the vehicle is being driven, or remains on for longer than approximately 10 seconds after the vehicle has been started, the SRS system's diagnostic functions have detected a fault in a seat belt lock or pretensioner, a front airbag, side impact airbag, and/or an inflatable curtain. Have the system(s) inspected by a trained and qualified Volvo service technician as soon as possible. See page 21 for more information about the airbag system. This symbol comes on for approximately 6 seconds if the driver has not fastened his or her seat belt. This symbol comes on during driving if a fault has occurred in the electrical system. Contact an authorized Volvo workshop. Engine overheating can result from low oil or coolant levels, towing or hard driving at high heat and altitude, or mechanical malfunction. Engine overheating will be signaled with text and a red warning triangle in the middle of the instrument display. The exact text will depend on the degree of overheating. It may range from High engine temp Reduce speed to High engine temp Stop engine. If appropriate, other messages, such as Coolant level low, Stop safely will also be displayed. If your engine does overheat so that you must stop the engine, always allow the engine to cool before attempting to check oil and coolant levels. See page 320 for more information. If this symbol lights, the brake fluid level may be too low. Stop the vehicle in a safe place and check the level in the brake fluid reservoir, see page 320. If the level in the reservoir is below MIN, the vehicle should be transported to an authorized Volvo workshop to have the brake system checked. 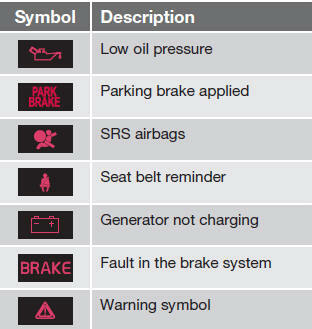 If the and symbols come on at the same time, there may be a fault in the brake force distribution system. 1. Stop the vehicle in a safe place and turn off the engine. • If both symbols extinguish, continue driving. • If the symbols remain on, check the level in the brake fluid reservoir, see page 320. If the brake fluid level is normal but the symbols are still lit, the vehicle can be driven, with great care, to an authorized Volvo workshop to have the brake system checked. • If the level in the reservoir is below MIN, the vehicle should be transported to an authorized Volvo workshop to have the brake system checked. • If the fluid level is below the MIN mark in the reservoir or if a warning message is displayed in the text window: DO NOT DRIVE. Have the vehicle towed to a trained and qualified Volvo service technician and have the brake system inspected. • If the ABS and Brake system lights are on at the same time, there is a risk of reduced vehicle stability. The red warning symbol lights up to indicate a problem related to safety and/or drivability. A message will also appear in the main instruments panel's display. The symbol remains visible until the fault has been rectified but the text message can be cleared with the READ button, see page 131. The warning symbol can also come on in conjunction with other symbols. 1. Stop in a safe place. Do not drive the vehicle further. 2. Read the information on the information display. Implement the action in accordance with the message in the display. Clear the message using READ. If one of the doors, the hood or tailgate is not closed properly, the information or warning symbol comes on together with an explanatory text message in the instrument panel. Stop the vehicle in a safe place as soon as possible and close the door, hood or tailgate. If the vehicle is driven at a speed lower than approximately 5 mph (7 km/h), the information symbol comes on. If the vehicle is driven at a speed higher than approximately 5 mph (7 km/h), the warning symbol comes on.